Say hi and enter for a chance to win a painting created during the Cathedral Village Arts Festival 2017! Photo courtesy of Stuart Anderson. 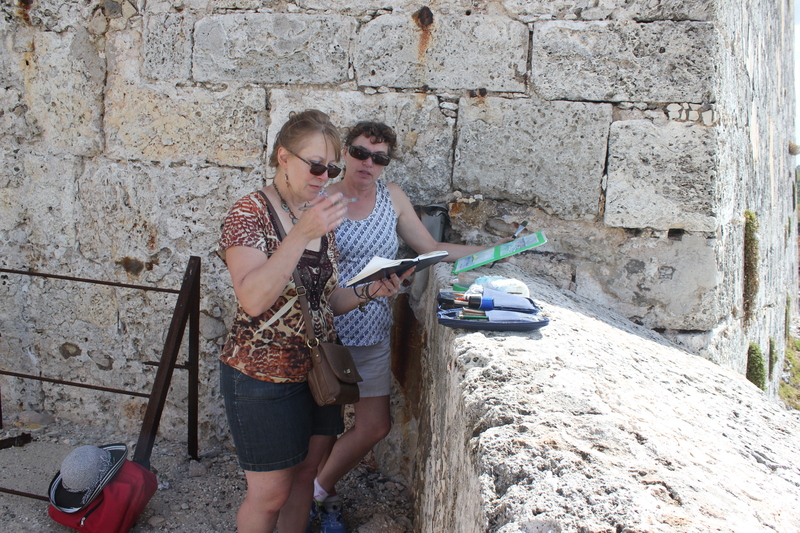 (L-R) Here I am painting with Christine Rumancik, painting holiday participant at Castillo Morro in Cuba. The winner will be announced Sun., May 28th, 2017 here on my blog at 2 pm CST! In past years I have participated as a vendor during the Cathedral Village Arts Festival street fair. I had no idea that the event went #allweeklong ! When I approached Margaret Bessai to see if I could document events during the festival she was quick to say yes and cal it an “art intervention”. My mission… to document in pencil, ink and paint as much of the week’s activities as I possibly can! This is going to be a challenge, but one I am looking forward to. I will have an opportunity to warm up my skills prior to some of my plein air classes and workshops starting this week with my “Cafe Sketchbook Tour” offered through the Neil Balkwill Civic Arts Centre in Regina and continuing through to September 15th – 22nd, 2017; when I take a group of students to Paint Plein Air in the Tradition of the Canadian Group of Seven in Cypress Hills. I had no idea that there would be so much happening and all of it free to the public (donations are accepted in support of future festivals and 50 / 50 tickets will be sold at various venues.) I had to carefully plan my strategy in order to select what I felt would be the most visually inspiring events. I can not be everywhere and sadly will miss some performances. To see the full list of events and venues visit http://www.cvaf.ca and click ” events”. Here is my plan for Day 1 of the festival! on Instagram, Twitter and Facebook! I hope to see you!